The steel head cover of the American soldier became an icon during World War II. 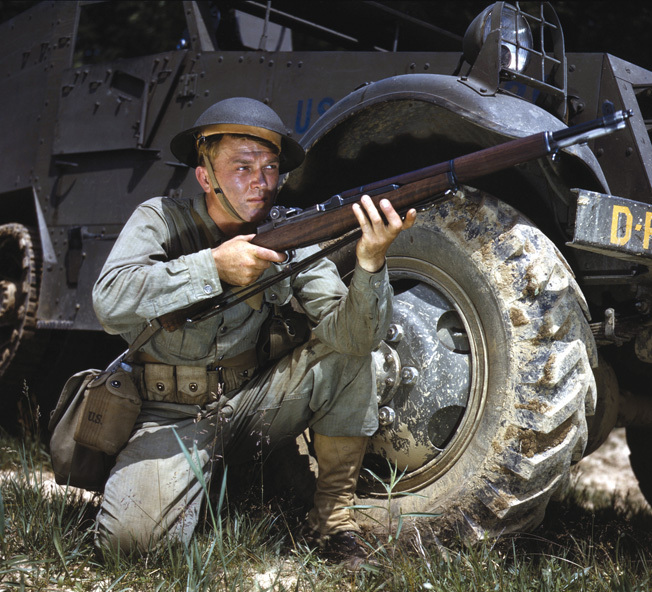 When the United States Army mobilized for defense in the fall of 1940, the peacetime draftees, National Guardsmen, reservists, and regulars carried Model 1903 Springfield rifles; the Guardsmen wore puttees; and all the soldiers covered their heads with the doughboy helmet—head-to-foot relics of World War I. Eventually modern equipment reached the field: leggings ousted the Guardsmen’s puttees, the gas-operated M-1 replaced the bolt action Springfield, and on June 9, 1941, the War Department authorized a chunk of personal protective armament destined for use by all United States servicemen in World War II: “Helmet, Steel, M1”—the GI helmet. Warfare’s first helmets stretched back at least to the Greeks if not before. The Roman combat helmet served the legionnaires for centuries. Nevertheless, by the 18th century armor and helmets had all but vanished from the world’s battlefields. Then, early in World War I, a French soldier placed a metal food bowl under his cloth cap. The bowl deflected a projectile and saved his life. Intendant-General August Louis Adrian noted the soldier’s luck and ordered tests. The resulting “casque Adrian,” a steel cap liner, first appeared in 1915. The following year the cap liner evolved into the classic French Army helmet. In 1915 the British Army adopted the Brodie helmet (MkI), named for its designer John L. Brodie. When inverted, the Brodie helmet resembled a soup bowl. Although heavier and uglier than the French helmet, the MkI proved ballistically superior. It could take a hit better. In 1917, the American Expeditionary Force (AEF) landed in France without helmets. The AEF quickly chose the British design because of the better impact resistance and ordered 400,000 through the British Quartermaster Department. Back in Washington the Ordnance Department modified the British MkI helmet, increasing the overall ballistic strength 10 percent. The American version, standardized as Helmet, M1917, had ballistic specifications requiring the helmet to “resist penetration by a 230-grain caliber .45 bullet with a velocity of 600 f.p.s.” American manufacturers produced approximately 2.7 million M1917 helmets by war’s end. With the Armistice in 1918 and the consequent evaporation of the AEF, the War Department entered peacetime with a large quantity of M1917 helmets. Nonetheless, the Ordnance Department and the Infantry Board wanted to find a better helmet, a helmet that not only satisfied the essential requirements of weight, ballistic resistance, and coverage but also the related problems of balance, method of suspension, and interference with other equipment. They chose a helmet designated the 5A and conducted tests at Fort Benning, Georgia, in 1926. The 5A’s pot-like shape covered more area on the sides of the head but proved heavier, more easily penetrated, and interfered with firing a rifle. The Army conducted further tests at the Aberdeen Proving Ground to compare the old helmet’s steel composition with the 5A.The M1917 proved superior. Consequently, the army rejected and abandoned the 5A in 1932. Even if the 5A had passed muster, the War Department’s stock of more than two million M1917 helmets versus the new helmet’s cost during the interwar years would have prohibited any spending by a parsimonious Congress that shrank military appropriations whenever possible. The anemic Depression-era Army had to soldier on with the doughboy helmet. One upgrade did slip through. In 1934, the M1917 received a modified lining of hair-filled pad. The steel helmet, two-piece canvas chin strap, and the new lining, with a combined weight of two pounds, six ounces, was then standardized as Helmet, M1917A1. 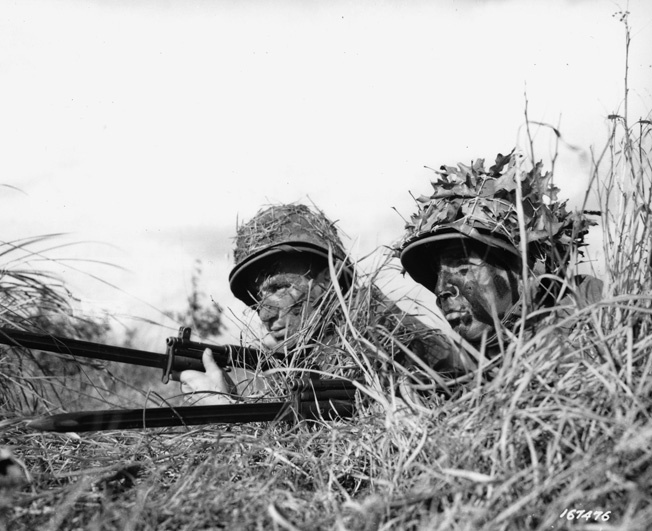 During training at the U.S. Army Ranger School in 1943, two soldiers are wearing the newly issued M1 helmet and liner. They have applied grass and leaves as camouflage. The 1940 defense mobilization brought new interest in helmet development. Army Ordnance magazine noted, “It was apparent that a washbasin-type helmet, originally designed to protect soldiers in trenches from fragments of shells bursting overhead would not be adequate in a war of movement where missiles could come from all directions—even from below, as in the case of parachute troops.” The year 1940 also brought a new assistant secretary of war, Robert P. Patterson, who well recalled the doughboy helmet’s faults. The former 77th Infantry Division Captain remembered the helmet as awkward, uncomfortable, and prone “to fall off in skirmish runs.” Patterson closely followed the new helmet’s progress, even to the extent of halting M1917A production until the replacement arrived. Charged with developing a new helmet, the Infantry Board wisely tackled the problems of both helmet and suspension system concurrently. In a report on the helmet the board stated: “Research indicated that the ideal shaped helmet is one with a dome-shaped top following the full contour of the head and supplying uniform headroom for indentation, extending down the front to cover the forehead without impairing vision and down the sides as far as possible to be compatible with the rifle, etc., and down the back as far as possible without pushing the helmet forward when in a prone position, and with a frontal plate flanged forward as a cap-style visor and the sides and rear flanged outward to deflect rain from the collar opening. Following these requirements, the designers simply took the M1917A1, acceptable for protecting the top of the head, cut off the brim and added the sides and the front and back flanges. The addition of a removable insert worn between head and helmet first appeared in 1932 during tests of the failed 5A. In 1940, the Army designers, at the suggestion of General George Patton, turned to the American playing field, borrowing the Riddell suspension system invented and patented by John T. Riddell, owner of a Chicago football supply manufacturing company. The Army Ordnance Department created a plastic impregnated fiber liner containing the Riddell suspension system. Covered with an olive drab cloth and fitted with an adjustable headband, the liner slipped snugly inside the helmet. In February 1941, the Infantry Board reported favorably on the first test helmet with liner designated the TS-3 (Test Section model 3). The helmet’s outer shell, made of the same Hadfield manganese steel used in the doughboy helmet, acquired new specifications. Tests at the Aberdeen Proving Ground indicated the new helmet “would resist penetration by a 230-grain caliber .45 bullet with a velocity of 800 f.p.s,” an improvement over the old helmet’s resistance to a .45 bullet at 600 f.p.s. The steel outer shell weighed 2.3 pounds, and the liner seven-tenths of a pound for a total of 3 pounds. On April 30, the helmet was standardized, and on June 9, approved as “Helmet, Steel, M1.” The Ordnance Department supervised the procurement and development of the outer shell, while the Quartermaster Department managed the development and production progress of the liner and suspension device. The first contract for the helmets went to the McCord Radiator Company of Detroit, Michigan. The new helmet’s development corresponded with the Army’s National Guard mobilization and the nation’s first peacetime draft. The Army needed helmets quickly, but new helmet production could not begin until mid-1941. The War Department had no choice but to order the manufacture of 904,020 of the M1917A helmets during the first half of 1941. But the old “tin hat” soon made way for the new “steel pot.” The helmet M1 went into full production in August 1941, and by V-J Day a total of 22,363,045 had rolled off the assembly lines. According to Army historian Harry G. Thomson, it was “a record for quantity production.” The liner, however, traced a slightly rougher history. A soldier who has also been wounded in the arm and leg shows a medic the piece of shrapnel that penetrated his M1 helmet but failed to cause a potentially fatal injury. In the summer of 1941, the original liner, developed as a plastic impregnated fiber hat worn under the helmet, proved inadequate. Consequently, the Standardization Branch of the Office of the Quartermaster General (OQMG) enlisted the aid of several private firms to experiment with various plastics. In 1942, a regular plastic liner was developed, although this too had problems. The Army’s Research and Development Branch, the successor to the Standardization Branch, worked diligently to improve the liner by adding an adjustable headband, eliminating pressure points, and coating the liner with textured paint less reflective than the original. Their efforts finally produced a successful liner. During the first stages of helmet and liner development, the OQMG sought to add a woolen head covering for warmth in winter. A knitted cap was adopted as a standard item in February 1942. But the Chief of Infantry disliked the cap, and in October 1942 the Army began the search for an all-purpose field cap. In the early months of 1943, using a ski cap as a starting point, the OQMG created “a windproof, water-repellent poplin cap with a stiffened sun visor, which gave protection to the eyes without protruding beyond the helmet liner.” Field cap, M1943 along with a new “pile cap of improved military characteristics … designed for wear in extreme cold,” became standard and replaced several different field caps then in use. A modification to the M1’s chin strap hook fastener resulted after combat experience in the North African campaign. Too rigid, the fastener remained intact when subjected to the concussion of nearby explosions. With the helmet fastened to the chin, the explosion’s impact jerked the head back resulting in fractures and dislocations of the cervical vertebra. Army Ordnance redesigned the strap with a ball and clevis release device that “would remain closed during normal combat activities but would allow for a quick voluntary release or automatic release at pressure considerably below the accepted level of danger.” Subjected to the ordnance engineers’ rigorous and extensive testing, the new ball and clevis device ultimately released at a pull of 15 pounds or more and was standardized in 1944. During the war, soldiers forced to live off the land with what they had quickly found other uses for the new helmet: a wash basin, cooking pot, and a latrine. Climbing from a foxhole during a barrage was dangerous for any reason. But more important for the average GI, the new helmet proved a lifesaver. 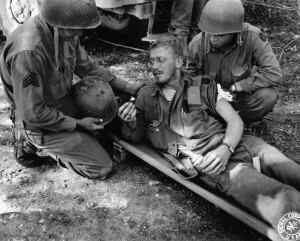 A postwar Army report found the M1 helmet cut battle casualties by 8 percent or 76,000 soldiers. More than half would have been killed in action. Sergeant Amelio Pucci of the 11th Airborne Division was one of them. 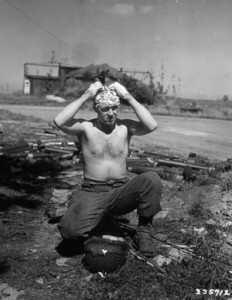 Necessity is the mother of invention for a soldier who uses his M1 helmet as a sink to wash his hair in August 1944 during a lull in the advance along the Western Front in France. In February 1945, during the retaking of Corregidor Island in the Philippines, Sergeant Pucci charged a Japanese position; his men saw him go down and noted the round hole in the center of his helmet. When another sergeant asked for Pucci, one of the men said, “He’s dead. Shot through the head.” A few minutes later the “dead” Pucci rose up with a tremendous headache but otherwise unhurt. The bullet’s force had spent itself penetrating the steel helmet and had rattled around between helmet and liner, falling out the back. When the M1 helmets began rolling off the assembly lines in 1941, the old tin hat, like an old soldier, began to fade away, turning up on the heads of air raid wardens and civil defense workers. But fate dealt a bad hand to the old helmet during the war’s early months. The doughboy helmet, worn victoriously by the AEF in World War I, became emblematic in World War II of surrender and defeat.The photographs of American soldiers on Bataan and Corregidor wearing the M1917A1 helmets, hands raised in surrender, will forever mark the tragic early days of World War II. The old helmet remains a historical marker of America’s military unpreparedness. Similarly, when the United States launched the nation’s first offensive ground action at Guadalcanal, the 1st Marine Division splashed ashore wearing the new M1 steel pot, forever marking the GI helmet as a symbol of victory in World War II. Tags Aberdeen Proving Ground, Africa, air raid, airborne, Allis, American, American Expeditionary Force, battlefield, British, British Army, Camouflage, Corregidor, Fort Benning, France, French, general, General George S. Patton, Greek, Guadalcanal, HBO, Japan, Japanese, John L. Brodie, lance, LCA, M1 Helmet, M1917 helmet, military, MkI Brodie helmet, national guard, north africa, OSS, Pacific, Philippines, Robert Patterson, Roman, Tern, The Western Front, Thor, Tory, United States, United States Army, United States Army Rangers, United States War Department, US Army, V-J Day, Western Front, WIN, World War I, wounded.